Rat Verlegh Stadion is a 19,000 capacity multi-purpose stadium located in the municipality and city of Breda. Home to local side NAC Breda since 1996, and primarily used for football matches, the Rat Verlegh ground has occasionally hosted concerts and music events. Rat Verlegh Stadion has been home to NAC Breda since 1996 when it opened as the FUJIFILM Stadium with an inaugural match held against at the time Brazillian World Club Cup Champions Gremio. Prior to this the club played at the 1930s built NAC Stadion which the club initially favoured for renovations but opted to construct a new stadium as modernisation proved to be economically unfeasible for the aged stadium. Costing an estimated 13.2 million euros, the new stadium opened with a capacity of 17,254 but has since been expanded to cater for 19,000 fans following two minor renovations. The first took place in 2009 and added an additional 500 spaces after some seating was converted to terracing, and then in the summer of 2010 the stand was reconfigures to allow approximately a further 1,250 places for fans. 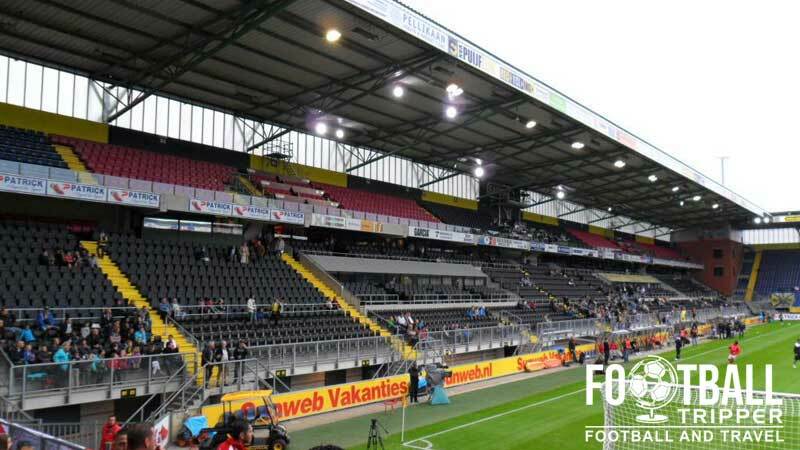 Over the course of the ground’s short history the stadium has had three official names, receiving its current name “Rat Verlegh Stadion” in 2006 after the the clubs most famous footballer, Antoon Verleght, who would later go on to become chairman of the NAC Breda. Before this it was known as the FUJIFIlm Stadium between 1996-2003 and then as the MyCom Stadium between 2003-2006. 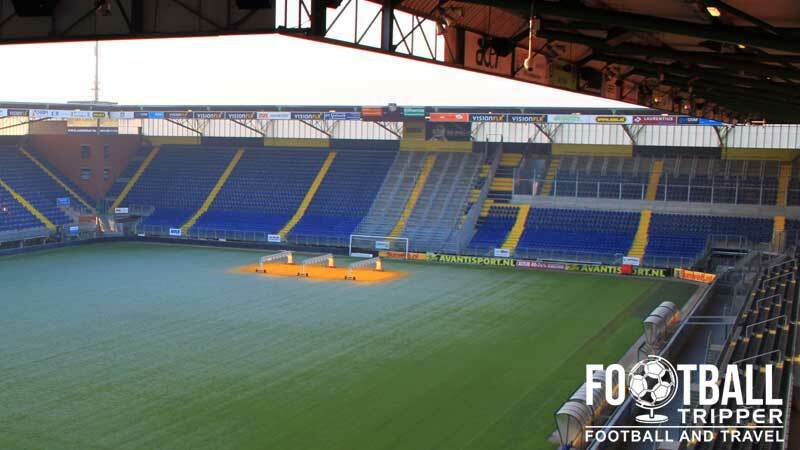 The highest level of football held at Rat Verlegh Stadion so far has probably been either the International friendly between Turkey and Ecuador in 2002, or the numerous UEFA Cup and Europa League matches held whenever Breda have qualified for the competition. Famous opponents have included Newcastle United, Villareal CF and Rosenborg BK from Norway. Rat Verlegh Stadium is comprised of four stands: North, East, South and West. Away fans appear to be housed within Sections H and I behind the southernmost goal. 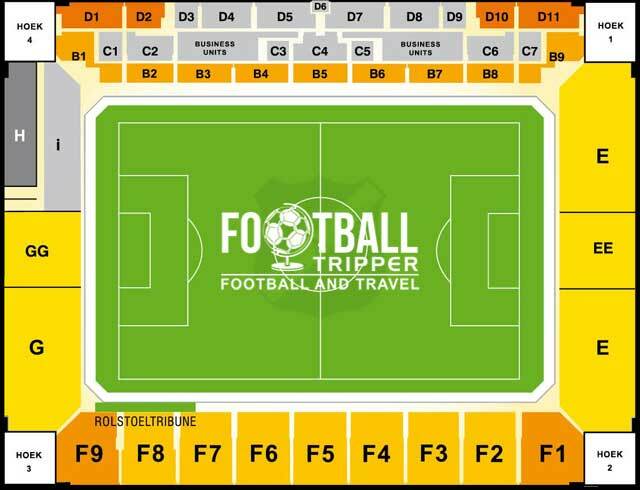 Essentially split into two-tiers, the upper section is allocated by default for the travelling supporters. With the exception of the online fanshop, the club store at Rat Verlegh is hands down the best place to purchase official merchandise of NAC Breda. 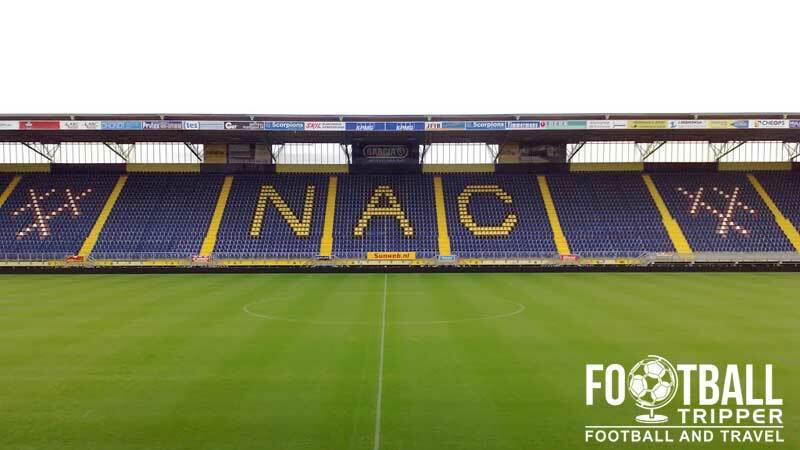 On matchdays the NAC Fanshop is open all day until kick-off and then for 1 hour after the full time whistle. Guided tours of the facilities at Rat Verlegh Stadion are available to both individuals, commercial and non-commercial groups by sending an email to [email protected] or phoning the club on +31 (0) 76 521 45 00. 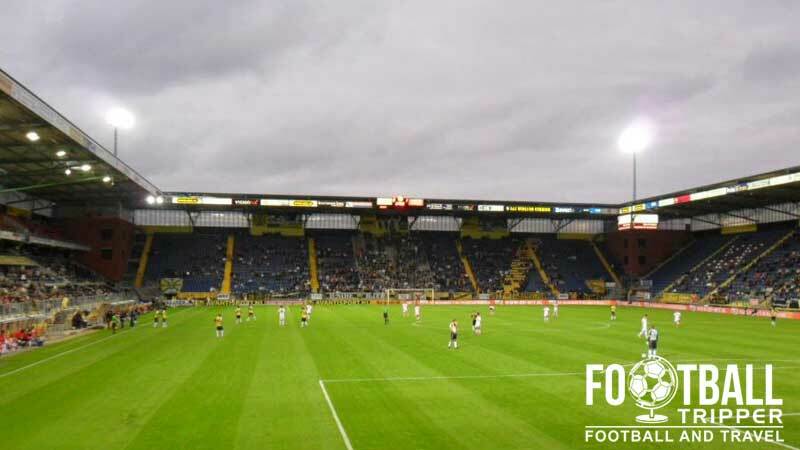 Tickets to see NAC Breda play at home can be purchased via the usual channels including online and in person from the ticket office at the stadium in the weeks leading up to the match. Please note that any tickets purchased on the day of the match carry a surcharge of €3.50 in order to offset staffing costs and to ease congestion. Rat Verlegh Stadion sits some 2.5 km north-west of Breda Centrum which equates to a walk of around 30 minutes for the average Football Tripper. There are a total of eight on-site car parks at Rat Verlegh Stadium however only Parking Steenakker is unreserved for use on matchdays. Boasting 1,500 spaces, this car park operates on a first-come first-served basis and is well signposted once you arrive. Breda Railway Station is centrally located within the city and sits on the railway lines between Rotterdam and Eindhoveen which makes NAC Breda an accessible day out for Dutch Football Trippers. The understated entrance to Breda’s railway station. From the back of the train station you can catch bus number 2 directly to the stop outside Rat Verlegh Stadion. Eindhoven Airport at 51 km away to the east is the nearest major airport to Brada however Rotterdam The Hague Airport at 64 km is arguably more accessible due to its renowned International status. All of the city’s accommodation options can be found within the centre of Brada which is marked out by a series of canals which together form a circle moat. The Apollo Hotel and Station Jeugdherberg Youth Hostel can’t be beaten for proximity to the station whereas Hotel de Klok and The Gulden Tulip are arguably closer to the night-life.